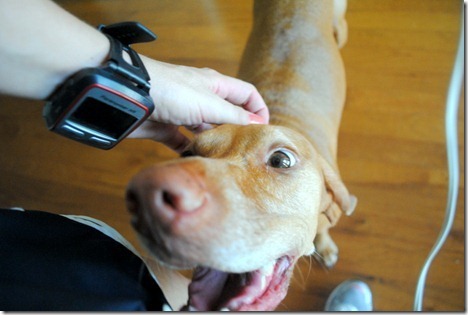 I am trying to figure out a way to bottle up her enthusiasm for running and market it to the masses. 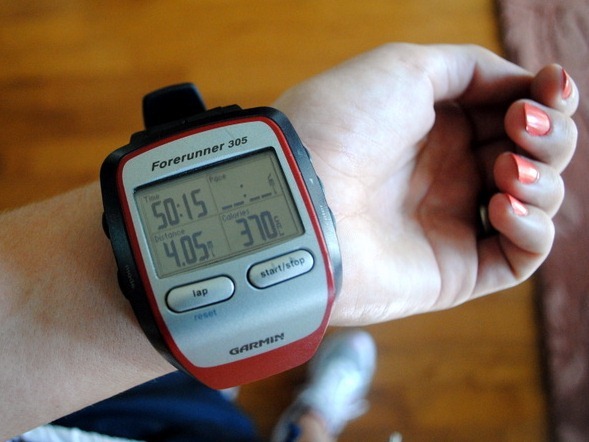 Sure, I love a good workout, but there’s no way I have that much enthusiasm before heading out on a run. 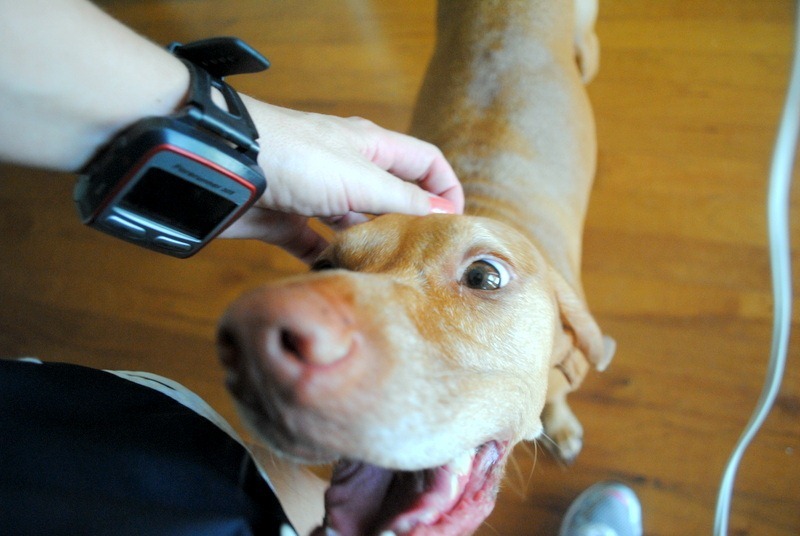 Fortunately a super-psyched up dog does a lot for my workout motivation and Sadie’s spunky attitude is what got me out the door a little before 9 a.m. after I published my morning blog post. Her sleepy attitude from this morning dissipated quickly and, since she didn’t get her usual morning walk, she was ready for some exercise. By the time I got up from my desk to wash the dishes from my breakfast, Sadie was at my feet giving me the eye. I leashed her up and we headed out for a three mile run followed by a one mile walk. 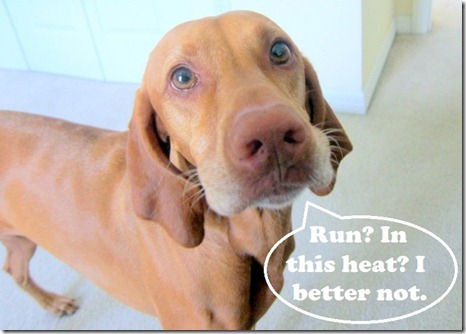 I planned to run five miles, but it was already so hot that I changed my game plan a mile into the run. 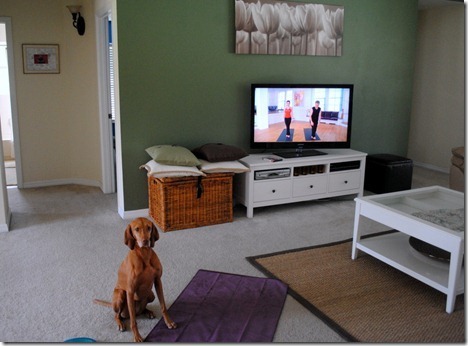 Sadie was not ready to cool down and made the first five minutes of my yoga practice rather miserable. She licked my face, weaved in and out of my body when I was in downward dog and pestered me until she got bored and plopped down next to my mat with a frisbee looking at me like I was a disgrace. 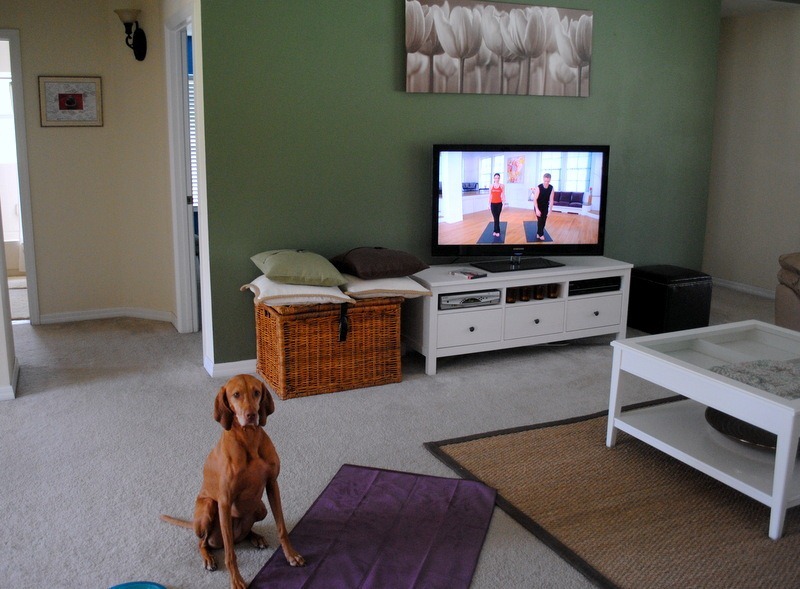 After yoga and a quick shower, I worked through the morning until my stomach started growling. Lunch today was a two-parter. Part one will surely gross some of you out, but those of you who love cottage cheese may be intrigued! That would be a surprisingly tasty bowl of chocolate cottage cheese! 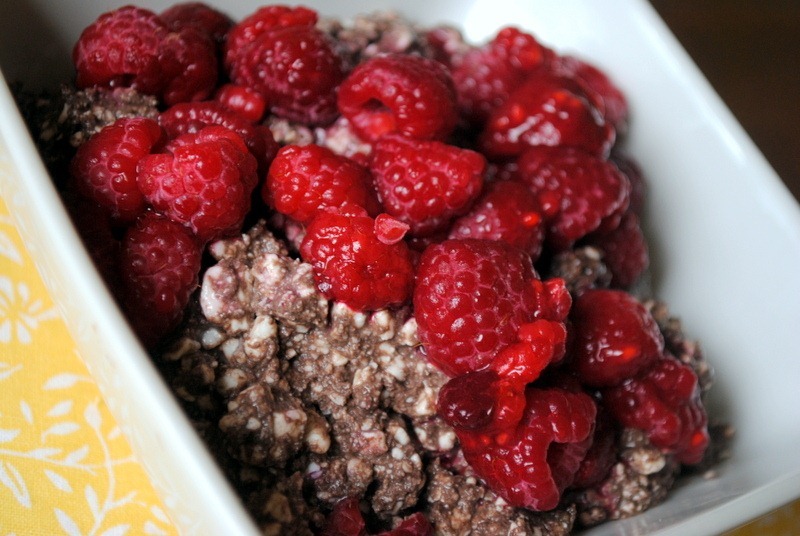 To make the cottage cheese, I combined 1.5 cups of 1 percent cottage cheese with a tablespoon of cocoa powder and a squirt of honey before topping it off with frozen raspberries that I quickly thawed in the microwave. I know it looks and sounds totally sketchy, but I loved it! 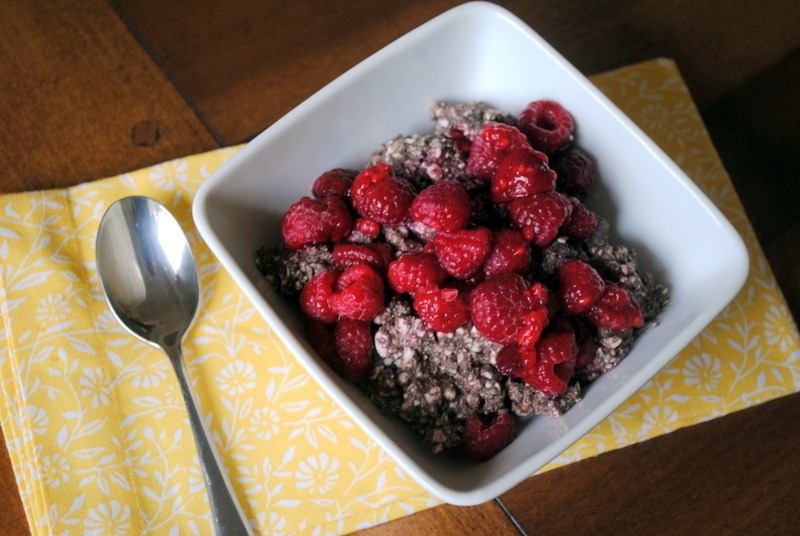 Protein-packed, full of chocolate flavor and yummy. It’s not for everyone, but it worked for me. Part two of my lunch included three-cheese scrambled eggs made with Alouette spreadable cheese, feta cheese and parmesan. I made the eggs with two eggs, egg whites (from a carton), onion, a sliced red pepper, roasted Brussels sprouts and the three cheeses and really enjoyed the combination of flavors. I now have a few freelance pieces that need attention. It’s hard to believe I’m working on winter assignments already! My pup is the same way! Wish it wasn’t so wet outside today, so we could enjoy a long walk! I am a BIG fan of cottage cheese and I think your combo sounds delicious!! One of my fave snacks is what I call”Nutter Butter” cottage cheese. I mix some truvia and PB2 or peanut butter into my cottage cheese and top it on a rice cake. So good!! Also, cottage cheese served over a sweet potato is another divine combo. Try it!!! 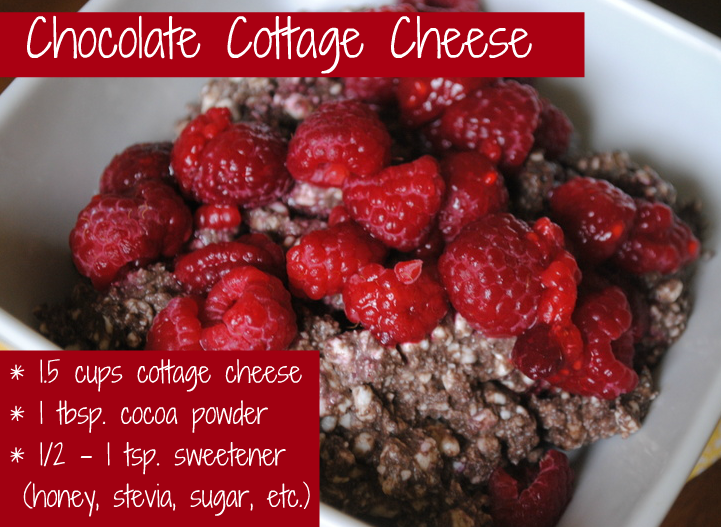 i make chocolate cottage cheese all the time. its actually sometimes my dessert. trying “whipping” it. stick it in your blender or small mixer until it’s a whip like consistency. doesnt seem like it would change much, but the change of texture is amazing! My cat does that too when I try to do yoga. She ignores me ALL day until she sees me on the mat and then all of a sudden she wants to be bff’s. Our 110lb black lab has the same frisbee! It is like his security blankie! It HAS to go everywhere he does. He could play 24/7 if we let him. I’m not sure he knows what it means to relax! 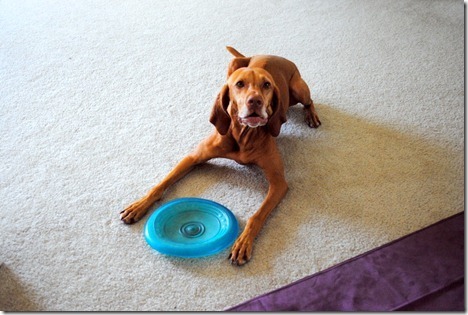 It’s the only frisbee we have found that doesn’t end of torn to pieces! My dog, Mojo, would like to “Friend” Sadie…loving the pictures and personality! 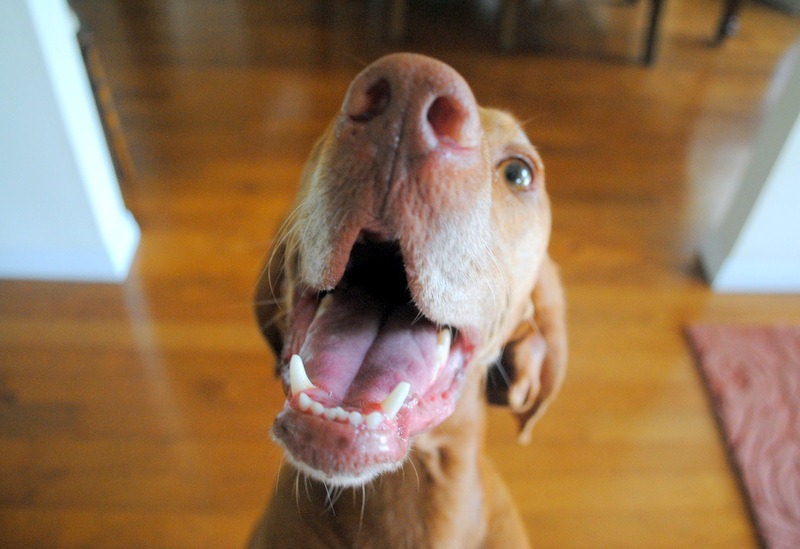 Sadie is my favorite blogger dog ever! Ive been making “cheesecake” from cottage cheese by adding a few drops of liquid stevia and lots of cinnamon. Amazing stuff! I will definitely add coco next time. her puppy smile is unreal! SO adorable! Is this yoga workout okay for beginners? I took a few yoga classes at the gym in college but I am not very flexible anymore but I definitely want to work on that. I love Jillian Michaels workout videos. I have three of them and my favorite is the No More Trouble Zones DVD. 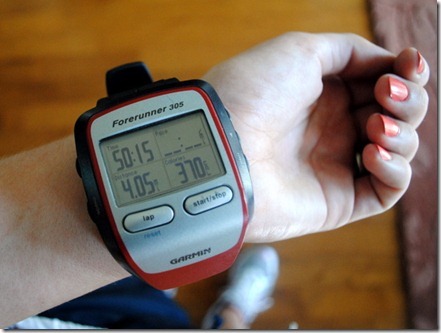 I am dripping sweat off of me when I finish that one! I also have her kettlebell DVD Shred It With Weights. hi brittany! it is definitely one that’s scalable! i am NOT flexible (or particularly good at yoga!) and i like it a lot. My black lab (Cruise) is the SAME way! Truthfully all you have to say is GO and his ears go straight up and he runs for the door. Pulling out his leash adds in some turns and jumps! 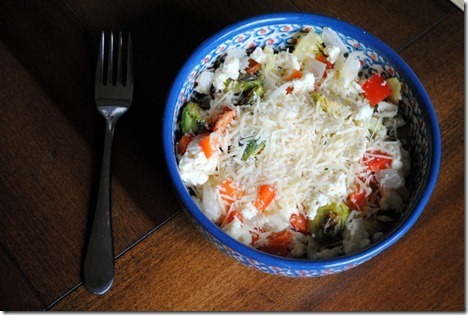 the cottage cheese doesn’t gross me out at all! I think it’s such a good treat~but I’ve never tried it with cocoa! I have that same coffee table. Ikea for the win! It looks like cottage cheese oatmeal ahha! 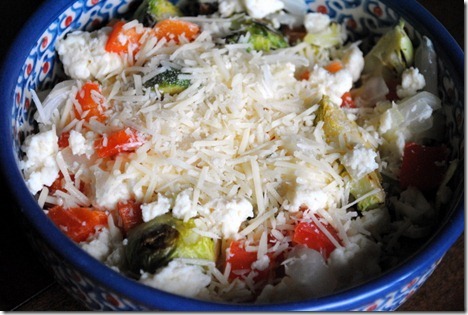 I am so glad other people line crazy cottage cheese combos! My husbands makes fun of mine all the time! My fave is cottage cheese, strawberry jelly, almonds, granola, dried cherries and dark chocolate chips topped with chia seeds. It’s a party inma bowl!!! It makes a DELICIOUS cheesecake mousse! I tried your chocolate cottage cheese and loved it!!! Hit my chocolate craving and was super filling!!! Thanks so much! that was princess’ face when it was time for breakfast. That dog loved her food. She loved walks, but she loved them so much she’d get excited to the point she couldn’t breathe, so she didn’t get to go on many of those. I almost always add cinnamon to my cottage cheese, you should try it!! 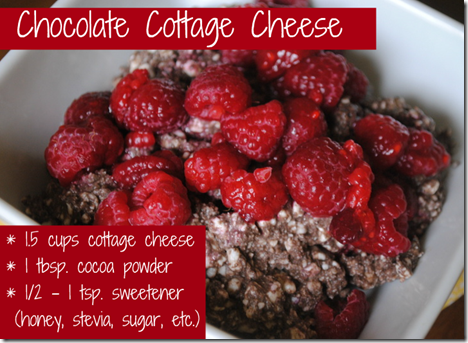 I’ve definitely made chocolate cottage cheese before too! My sweet tooth was raging but I wanted something with protein to keep me satisfied. I just mixed a packet of hot cocoa in with my cottage cheese =) I also love adding a hot cocoa packet to my oatmeal before I cook it. Delish! I shall never tire of Sadie photos. Ever. Just sayin’.